Once upon a time, a strange thing happened at the Ionia State Hospital in Michigan: A diagnosis of schizophrenia exited the body of a white housewife, flew across the hospital, and landed on a young Black man from the housing projects of Detroit, burrowing into his body and stubbornly refusing to leave. As you may know, Black men in the United States (as well as in the United Kingdom) are disproportionately diagnosed with schizophrenia. What you may not know is when this pattern emerged, or why. Up until the 1950s, the overwhelming majority of those diagnosed with schizophrenia were white. They were the delicate or eccentric -- poets, academics, middle-class women like Alice Wilson in Jonathan Metzl's The Protest Psychosis, "driven to insanity by the dual pressures of housework and motherhood." 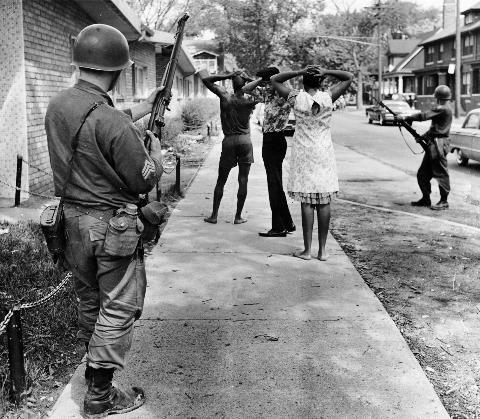 Then, in the mid-1960s, the Long Hot Summers hit urban America. 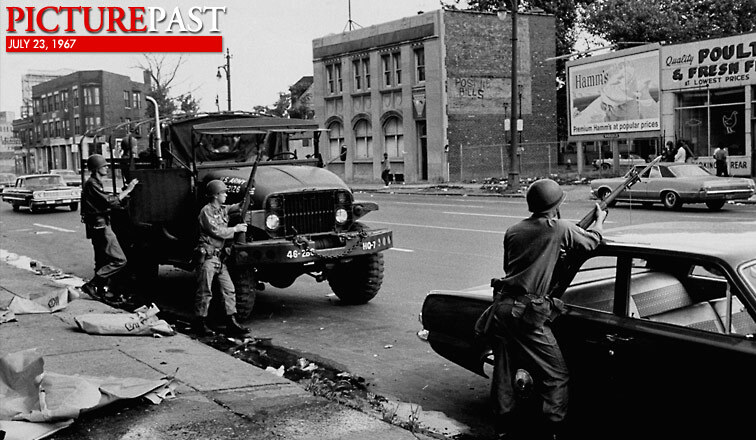 Smoldering anger over racism and poverty erupted into mass rioting and harsh repression. In Detroit, a police raid on a party triggered an uprising that left 43 dead, 1,189 injured, and more than 7,000 arrested. Convinced that they would never win civil rights through sit-down strikes, a nascent Black Power movement became increasingly militant. Coincidentally, just as this urban unrest was reaching its zenith, the American Psychiatric Association was busy revising its Diagnostic and Statistical Manual of Mental Disorders (DSM). Published in 1968, the DSM-II was touted as a more objective and scientific document than its 1952 predecessor. "However, the DSM-II was far from the objective, universal text that its authors envisioned," writes Metzl, a psychiatry and women's studies professor and director of the Culture, Health and Medicine Program at the University of Michigan. "In unintentional and unexpected ways, the manual’s diagnostic criteria -- and the criteria for schizophrenia most centrally -- reflected the social tensions of 1960s America. A diagnostic text meant to shift focus away from the specifics of culture instead became inexorably intertwined with the cultural politics, and above all the race politics, of a particular nation and a particular moment in time." The psychoanalytically imbued "schizophrenic reaction" of the DSM-I was an illness meriting pity and compassion rather than fear. In contrast, the DSM-II's more biologically oriented schizophrenia was menacing and required containment. In particular, the language that described the paranoid subtype foregrounded "masculinized hostility, violence, and aggression," implicitly pathologizing militant protest as mental illness. Almost overnight, the previous class of schizophrenics at Ionia State Hospital was relabeled with depressive disorders. 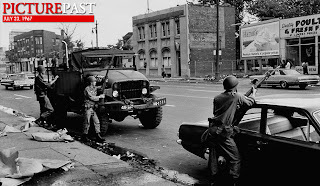 As the formerly schizophrenic exited the hospital en masse in the wake of the Community Mental Health Centers Act of 1963, their places were taken by a new class of schizophrenics -- volatile young Black men from inner-city Detroit. A mountain of archived charts from the defunct asylum at Ionia provided the raw material for The Protest Psychosis. In his four years of sifting through the treasure trove of data, Metzl found clear evidence of shifting racial and gender patterns in diagnosis. Because the DSM-II was published in the days before computers, clerk typists simply used hatch marks (/) to mark out the old diagnoses, leaving them clearly legible alongside the new. Randomly selecting a subset of charts of white women patients, Metzl found schizophrenic diagnoses crossed out, and replaced with labels such as Depressive Neurosis or Involitional Melancholia. In contrast, the charts of African American men saw Psychopathic Personality crossed out to make way for the DSM-II’s schizophrenia, paranoid type. Neither set of patients had undergone a sudden metamorphosis. Their observable symptoms and behaviors, as documented by their chart notes, remained the same. The only thing that changed was the diagnostic manual. Metzl is a lyrical writer who has thought deeply and profoundly about this topic. His asylum tragedy does not point fingers or blame the individual psychiatrists of the asylum. They, too, were victims of time and place, just doing their job. Doing it, indeed, by the book. Lessons learned, or lessons lost? The lessons of Ionia can be applied to almost any diagnostic saga. Today, the message -- if we choose to listen -- is especially profound. As Ethan Watters explores in Crazy Like Us, American psychiatry is sweeping the globe like a virus, importing PTSD to Sri Lanka and Western-style depression to Japan. Big Pharma is responsible for much of this McDonald's-like expansion. The pharmaceutical industry is far and away the most profitable business in the United Sta tes, and accounts for almost half of the $650 billion-plus global market. In its quest to enlarge profits, this industry perpetually seeks to expand the range and scope of illness. As Christopher Lane describes in Shyness, this expansion is especially easy with psychiatric illnesses, because of their nebulous nature and subjective boundaries. 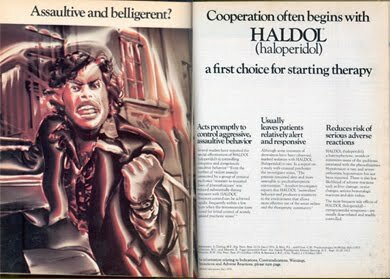 But Big Pharma did not revamp schizophrenia back in 1968. Nor were nefarious doctors consciously seeking to re-enslave a rebellious race. Like treatment providers today, psychiatrists undoubtedly saw themselves as helpers, even as they functioned as agents of social control, naturalizing today’s long-term containment and incapacitation of African American men. Psychiatry, as Metzl points out, is inherently focused on the molecular. 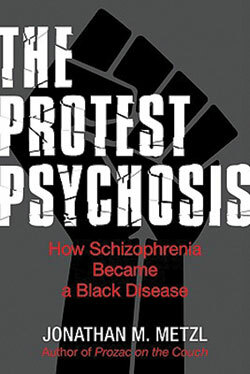 With their focus on matching individual symptoms to diagnostic codes, the psychiatrists who replaced one diagnosis with another were blind to how institutional racism shaped their choices. Nor did they reflect on their own internalization of the era’s cultural anxiety over menacing Black men, an anxiety that linked mental illness, protest, and criminality. A focus on the micro-level blinds the actors to the larger forces at play, which construct the very frames governing observations and actions. Larger social and institutional forces rather than conscious intent on the part of individual actors typically drive bias, especially in the 21st century. This explains why “cultural competence” training programs are at best useless, and at worst reinforcing of stereotypes. We are currently entering another period of diagnostic revision. What I find fascinating is how earnestly the proponents of new and expanded psychiatric diagnoses believe that they are agents of progress, advancing better science as opposed to ideologically driven agendas. Mesmerized by their own brilliance, they wear blinders that prevent them from seeing the larger cultural systems in which their ideas are embedded. But science is never pure. There is no one objective truth. There are myriad ways to categorize and catalog. Bias is inherent in what is foregrounded and what, in turn, is neglected or ignored. Reification, in which hypothetical categories are transformed into tangible and real objects, keeps us from recognizing and naming the larger systems that dictate these choices. Occasionally, a historian like Metzl comes along to sift through archival evidence and shine a spotlight on historical biases. But the biases inherent in the present moment remain largely invisible. With the arrogance inherent in power, privileged scientists have no need to confront their own cultural assumptions, or reflect upon how the world might look from the perspectives of their subjects. Sadly for all of us, as the old axiom goes, those who do not learn from history are doomed to repeat it. 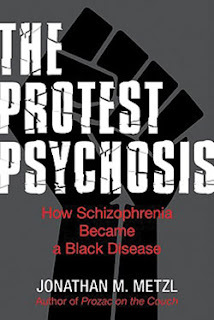 The book is: The Protest Psychosis: How Schizophrenia Became a Black Disease. An online essay adapted from the book is HERE. Metzl is also the author of Prozac on the Couch, Prescribing Gender in the Era of Wonder Drugs and editor of a book forthcoming from NYU Press, Against Health: How Health Became the New Morality. A University of Michigan press release about his published work on "medicalization" is HERE. If you enjoyed this essay, please visit my abbreviated review at Amazon and click on "YES." This essay is also available at my Psychology Today blog, Witness and at AfroDaddy: A Black Man's Survival Guide (sadly, that site is now defunct, but the post is still available via the ever-amazing Wayback Machine). Hi Karen. I just posted a link to your blog on the links page at www.DepthPsychologyAlliance.com. Your blog entry is an informative and insightful commentary on a problem that has been troubling me in my own Depth Psychological studies. How do we assure that Psychology does not do more harm than good by trying to fit everyone into a "cookie-cutter" mold? Paranoid schizophrenia is definetly overdiagnosed in blacks. Could be why schizophrenics have such high noncompliance rates. And also could be why schizophrenics have lower suicide rates compared to other mental illnesses. As blacks have lower suicide rates. However psychiatrists have high rates of suicide. Medicaid pays for 70 % of antipsychotics. Karen Franklin, Ph.D. is a forensic psychologist and adjunct professor at Alliant University in Northern California. She is a former criminal investigator and legal affairs reporter. See her website for more professional background. If you find this blog's content helpful, you may subscribe to its digest version using the subscription form immediately below. "The best predictor of future behavior?" What is "a reasonable degree of scientific certainty"? Can school shootings be prevented?